And Toadman's pictures of an M3A5 Grant for rear deck references as well. I'll have to scratch build the rear deck. That means throwing in an engine, which would be my first. I wonder if one even exists (the M3A3/5s shared an engine with the M4A2 and the M10, so it shouldn't be too hard). Alternatively, I'll just make a flag out of Milliput and drap it over the deck. That would be easiest and cheapest. 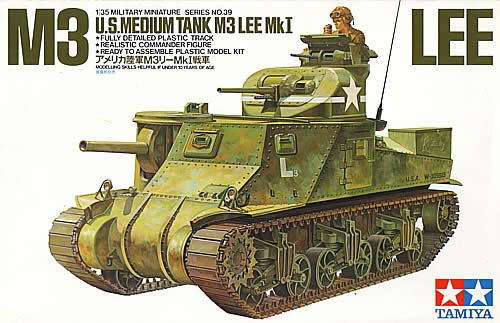 So is there any particular reason the US military had three vehicles named the M3, the half track, the Stuart, and the Lee? Last edited by armor fiend; 08-12-2009 at 09:01 PM. What do I need for this? Proper 5 spoked road wheels, T-51 track. As to why Grave of Six Brothers, that's what the Soviet tank crews called the M3s. Last edited by armor fiend; 07-18-2009 at 02:00 PM. Well, that is what the Soviet propaganda called the tank. Nothing they got from the West really helped them defeat the Germans... or so they said. Not that is was a superior tank at that time, but other than the KV-1 and the T-34, what was for them? We have a restored M3 here in Perth. The one Terry @ PMMS used. Good luck with your build . Nothing they got from the West really helped them defeat the Germans... or so they said. Trucks, half-tracks and millions of kilometers of wire were the real stars of lend-lease [plus a blood great pile of felt boots. , but other than the KV-1 and the T-34, what was for them? Did they need better than these two? One T34/85 nailed a platoon of King Tigers . Nothing in the west ever comes close to dealing with the Nazi war machine as those two Soviet tanks [well the P-47 Thunderbolt and the Hawker Typhoon were the best two tanks for us ]. Last edited by Coops; 07-18-2009 at 07:23 PM. Reason: Sounded like a rant, sorry Ruud :). I know, just being sarcastic mainly. I just take a little offense to the PR that states that lend-lease did nothing to help. The M-3 might not have been a world beater, but if used right it did pack a punch and could knock out panzers in service at that time (42-43). Not even T-34's and KV's stopped the Germans in 1942 in large part due to leadership and tactics (IMHO). Indeed the Russian army road to Berlin on US trucks and also walked there with plenty of US made boots. Then add all the other raw materials, food, etc. etc. Mind you, this support in no way belittles the ultimate sacrifice so many Soviet citizens made. Sorry Ruud, I totally agree with you about LL. The wire I mention was used for battlefield communications so you could say that just about every order that given [not by radio] was done with the aid of LL. While not a glamorous it was a critical component of Soviet C&C . The felt boots helped move Soviets grunts through snow in the late 42 early 43 operations. Boots, communication wire and transport, the big three . BTW the Lee was critical for a short time in North Africa IIRC . Last edited by Coops; 07-20-2009 at 08:39 PM. Reason: Gotta get it right somehow :). AF, have you seen this link? I hope it helps . I'll have some pictures soon. When I was planning to OTB it, I had already cemented the 75mm in the tank. Since I've ordered a turned metal barrel, I tried to remove it, but I cemented it so well (for once) that it snapped. Now I have to drill it out. Right now, I'm thinking I might do this as an M3A3, and shave off a bunch of bolts. Since I've decided on an M3A3, since the size of the Tamiya bolts is wrong, I've noticed you can hardly find any damn photos of an M3A3, at lest of the rear deck . . . unless it's a Stuart instead of a Lee/Grant. Pictures of Monty's Grant keep coming up, listed as an M3A3 . . . except the hull is clearly bolted, i.e., it's an M3A5. Why has no one caught this before? The more research I do, the more I find wrong with this kit. Why oh why did I ever do any research? It could have been a happy little OTB. Last edited by armor fiend; 07-22-2009 at 08:32 PM.